We are so blessed by Emma’s school! 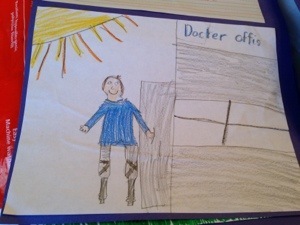 Yesterday she came home with the sweetest cards for Ian from her classmates. 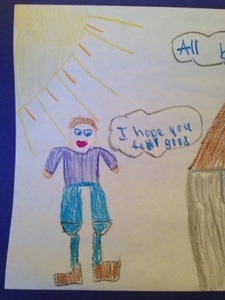 I thought I would share some drawings and thoughts of first graders. They are so sweet! Check out these prosthetic legs! Dear Mr Warshak, I’m so very sorry that your arms and legs came off but I am happy that you can still use them. I am so sorry that you got sick but at least you got better. How are you doing today? I’m glad you are feeling better. Another set of awesome prosthetics. 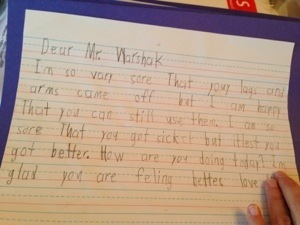 Dear Mr Warshak, I hope you feel better. I really liked your father of the day. It’s cool how you work on computers with no fingers. You are very nice. I like you. I hope you feel better! Aren’t these just precious?? Wish I could share them all!! What sweet treasures! 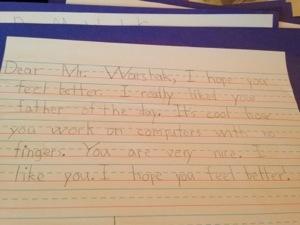 You have the best teacher, too, for coming up with this idea.